Fourth Row Center: Film Writings by Jason Bailey: In Theaters: "Cop Out"
I was talking with a friend about Kevin Smith’s Cop Out, a buddy-cop action-comedy starring Bruce Willis and Tracy Morgan, and we seemed to agree that while I wanted it to be an enjoyable goof from one of our favorite comic filmmakers, it sure did look like the kind of terrible formulaic movie that we’d see a poster for on the wall of Morgan’s character’s dressing room on 30 Rock. “It’ll be one or the other,” I told him. Joke was on me. It’s both. The tried-and-true conventions of the genre—the racially mismatched partners, one of them a motor-mouthed loose cannon; the stripping of the guns and badges; the rivalry with other detectives; the stumbling into a big case with their breaking-all-the-rules shenanigans; etc.—have been wheezy for well over a decade now, and the screenplay by Robb and Mark Cullen isn’t some sort of post-modern riff or parody. Director Smith instead plays it as an affectionate homage to the 80s action comedies he grew up on—it’s the kind of movie that could easily play on a double-bill with Fletch (dig that closing music), Beverly Hills Cop, or Running Scared, right down to the synthy Harold Faltermeyer score. Those films, even the best of them, were disposable entertainments—sheer popcorn. By attempting to replicate them, Smith is, it could be argued, wasting his considerable talent on a glossy copy of throwaway pictures. 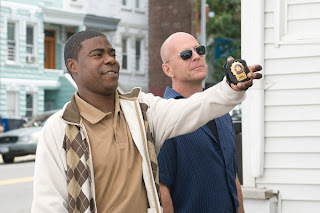 It’s a credible argument, hampered only by the fact that, in spite of its derivative nature and frequently weak writing, Cop Out is a good-natured and genuinely likable movie. Some of the humor is strained, and the picture has trouble firing up its own engines in the opening scenes, but there are laughs to be had here—some of them from Morgan’s over-the-top persona, some from Willis’ unflappable (and finely-tuned) persona, some from Smith’s infectious sense of a good time being had. Cop Out marks Smith’s first time directing a film he didn’t write, and some will find that perplexing—he was always a writer first, and the first to cut down his skill at staging scenes and moving the camera. But it’s a well-made, good-looking picture, and his shoot-outs and chase scenes are smoothly, professionally handled. I had objections to Cop Out, but they’re all intellectual ones; from the standpoint of goofy fun (which is all they’re going for anyway), Smith and crew bring it off. "Cop Out" is now playing in wide release. For more on Smith's career to date, see my DVD Talk review of his Blu-ray box set.